Yesterday in the afternoon Stadion Śląski confirmed the building’s roof is complete. And just in time, because December 17 was set as the official deadline for delivery. Previous expectations gave the date at late November, but the slight delay has no impact on future reopening, because there’s still work to be done on the ground. In fact, reopening after reconstruction is scheduled as late as mid-2017. The crucial news is: it’s up, it’s complete and it’s safe. The cable roof was lifted for the second time this year after it had burst during the first operation, back in 2011. It was the first such accident on any cable roof to be mounted atop a stadium. Several independent studies suggest that the design was at fault and required alterations. Now the lightweight roof is complete, meaning 3,000 tons of steel and polycarbonate hover above what will be a 54,000-seater stadium. Since it’s not covered with membrane but rather translucent polycarbonate tiles, it’s the largest roof of its kind. 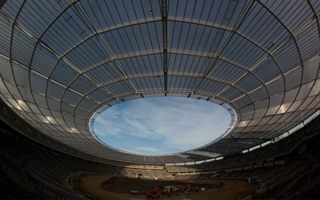 43,000 square meters is indeed a vast surface, especially when you look at the roof’s outer ring, measuring 332 meters (1,100 feet) in diameter from north to south. Minor further works are required on the roof, including the installation of giant screens, floodlights and speaker system. Below there are still the seats, field and running track waiting to arrive, not mentioning secondary structures and furnishing of Poland’s second largest stadium.